Container Size Dia 28 mm-125 mm,320 mm Height Max. SVSSA 100/200/300 is designed to insert sleeve with the desired position on various size and shape of containers. this unique model is suitable for the variety of industries with an opportunity to reduce labor and increase manufacturing rates. The machine having integrating functions of delivering & classifying containers, accurate cutting of label sleeving and proper positioning sleeve on a bottle. SVSSA 100/200/300 is constructed of sturdy welded steel frame completely enclose in S. S. sheet doors and aluminum alloy. The unit consisting of sleeve roll loader-carrier assembly, Conveyor bottle separating assembly, Center pillar, Bottle positioning mechanism, Cutter mechanism, Optical scanner, Controlling assembly and Brush assembly etc. This model operates with great simplicity, high efficiency and minimal maintenance with production capacity up to 300 BPM. Rigid Structure constructed SS and anodizing aluminum alloy. The fully automatic machine with speed up to 300 BPM. Statics Charges elimination system for accurate sleeve placement. No Tools required for changeovers from one size bottle to another. 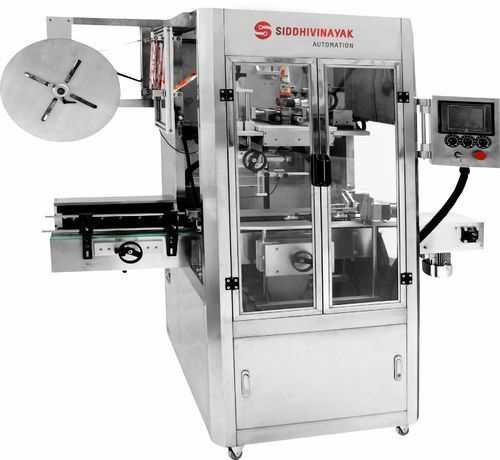 The servo-based high speed with accurate length sleeve feeding and rotary sleeve cutter system. Online speed can vary & fully synchronized with all mechanism. Suitable for a various shape of Glass, Plastic, Pet, Tin, Corrugated Containers. Sleeve Labe Roll Empty: Machine stop with Alarm. pneumatic operated product rejection system. Tower light: Indicate the status of a process. Established in 2014, we, Siddhivinayak Automation are a partnership firm which is engaged in the Manufacturing and Exporting of high-quality Industrial Machinery. Offered products range consists of Sticker Labeling Machine, Shrink Tunnel and much more. We are equipped with a spacious infrastructure. In addition to this, the team of our company works in closes coordination with each other and meets a lot of requirements in a stipulated time frame.